Heading into winter strong. We are in the midst of some really exciting growth spurts since our federal not for profit incorporation in June 2014. Our pack is expanding critical representation across North America bringing coexistence to communities, one community at a time. Song Dogs! 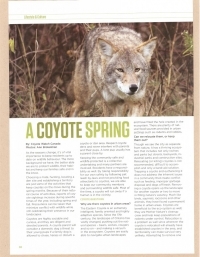 We know you all care very much about the wildlife in your community. 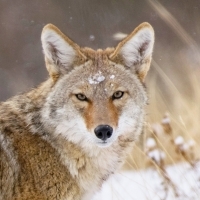 Coyote Watch Canada hotline is receiving a significant increase in the volume of coyote and fox sightings which are typical for this time of the year. 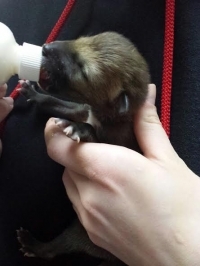 How a compassionate family reached out across Canada to Coyote Watch, embarking on a life changing journey which saved nine beautiful coyote pups… On Friday, April 25th, my sister received a text from our uncle stating how he had found some newborn pups of some sort whilst checking on the family farm. 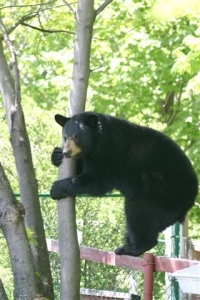 Learning about black bears is a humane response and responsibility of us all. Mike McIntosh, of Bear With Us shared his knowledge and experience working with black bears (bears) with an enthusiastic audience at Heartland Forest Friday evening. 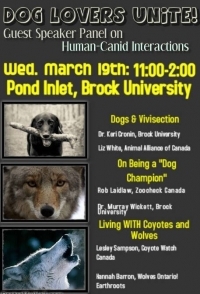 Folks from across southern Ontario braved frigid temperatures and snow drifts to attend this educational event.